R. PAUL WEBER, a conductor and organist well known to all those who love Sacred music, directed the Schola Cantorum Franciscana for the first Tridentine Mass to be offered at the Franciscan University of Steubenville in many years. The Mass was offered on the Feast of Christ the King in the university chapel with approximately 350 students, staff and visitors in attendance. The celebrant was Fr. Gregory Plow, the Deacon was Fr. 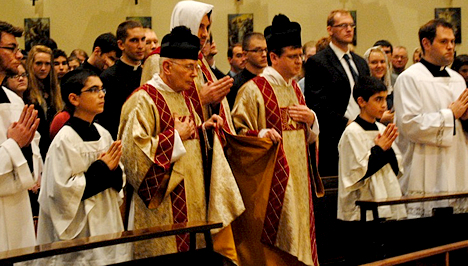 Vincent Huber, and the Subdeacon was Fr. John Larson, MIC. By the way, many friends of Corpus Christi Watershed currently attend the Franciscan University of Steubenville.